There is not a great deal to report from Sorel from the past month. Most of the time both birds and manager have been anchored down trying to make it through the force 10 winds and onslaught of rain or sleet. 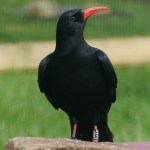 The choughs have fared better than the manager, taking the opportunity to practice sideways gliding through hatches, airing their flight feathers, and getting stuck into the mud searching for insects. 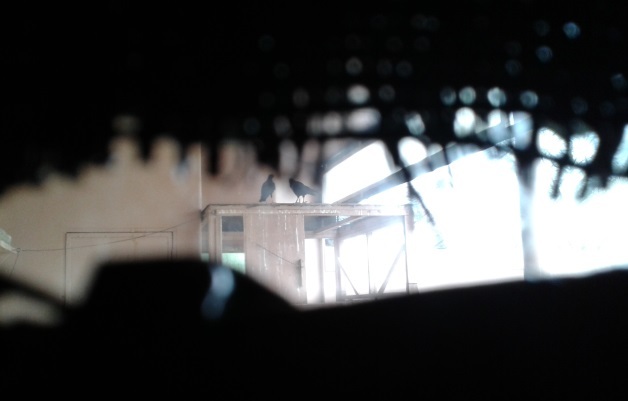 Confinement to the aviary does limit their options for shelter, but all birds have so far seemed pretty happy. 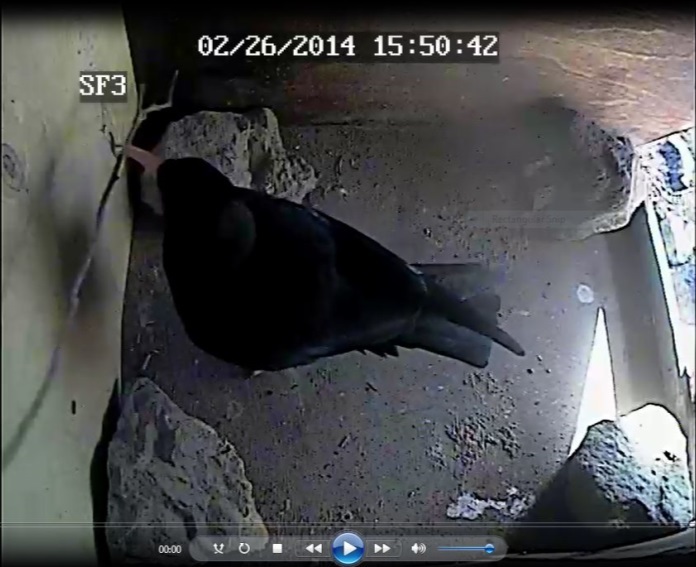 The only evidence contrary to this was picked up by the aviary security camera. 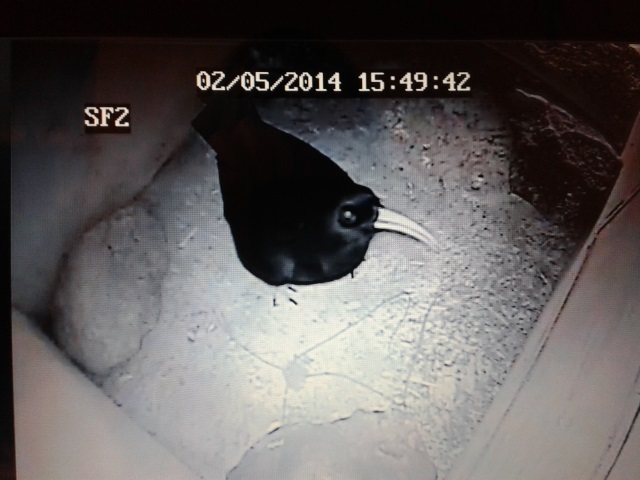 Two of the choughs had a falling out recently which caused a lot of excitement amongst the other birds. Luckily it ended quickly with no injuries sustained, but maybe a bruised ego. Behavioural training and weighing of the birds has been difficult because of the weather. On the days when the electronic scales have been able to make an appearance the readout has shown discrepancies. This is probably due to the wind getting under the top pan balance and the movement throwing off the scales. The birds have been sluggish in their response to the whistle training. Without knowing body weights it is difficult to know whether the lack of motivation is due to the weather or full stomachs. 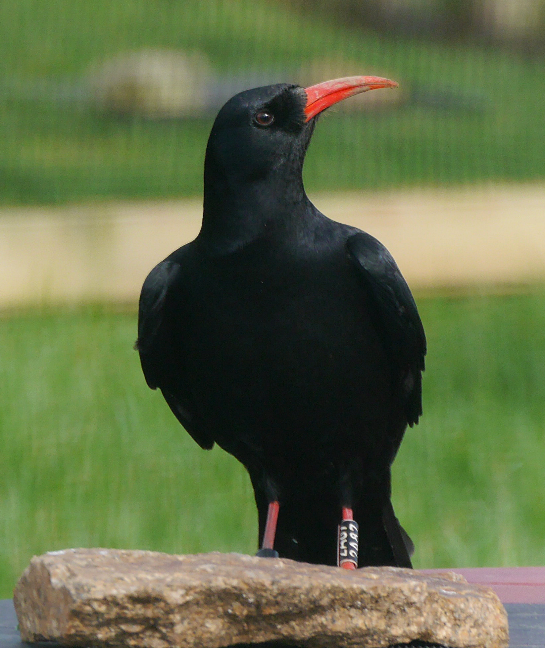 At the start of February the choughs at Durrell were moved from the flocking aviary to their breeding aviaries. The catch-up process took two days. The flocking aviary has a very large flight space! In order to catch birds they first need to enter a smaller enclosure at the back of the aviary beforehand so nets can be used. Only two of the three pairs needed to be moved out. To complicate m atters the pair staying in the flocking aviary, Arthur and Issy, treated the back area as their territory. They would not let the other birds feed from the dishes put there to lure the birds in. On the second day Arthur and Issy were caught up and kept in pet carriers in a darkened room. This allowed the other birds to get to the food. The first in were Gwinny and Mauve. Slightly cautious of seeing what had just happened to the other pair Mauve spent a lot of time standing guard in the doorway, but eventually his hunger took over. Tristan and his partner were less caring and went in within a few minutes after Gwinny and Mauve were caught. 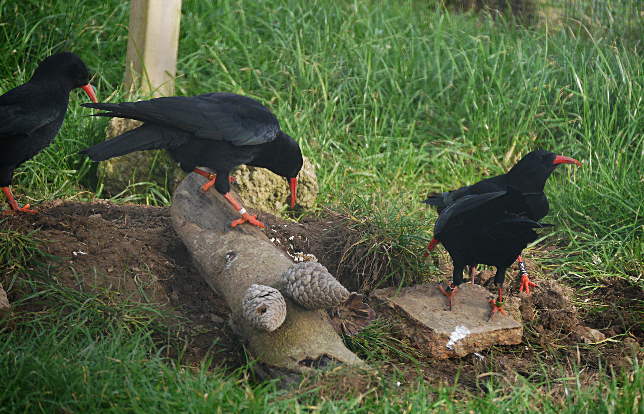 All the choughs were in good condition. The young female had new leg rings fitted as she had lost her old ones. She was moved into Shep’s Field 2 (SF2) along with Tristan. Gwinny and Mauve went next door in SF3. 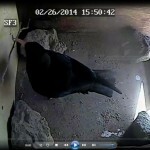 The nest cameras were already rolling and showed both pairs taking a keen interest in their new surroundings. With the necessary birds removed, work could then begin on setting up the flocking aviary as a temporary breeding aviary. 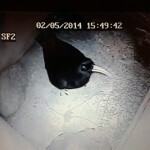 A nest box, donated by Paradise Park, has been fitted with a camera and connected to a monitor in the keeper porc h. This will provide a continuous live feed to monitor progress of nest-building and hopefully egg-laying. Gianna will remain in the aviary with Arthur and Issy unless she proves to be too much of a disturbance. 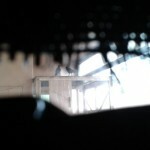 She continues to knock on the inner door when she hears a keeper unlocking the external door. This creates quite a racket which might not be appreciated by a brooding female. 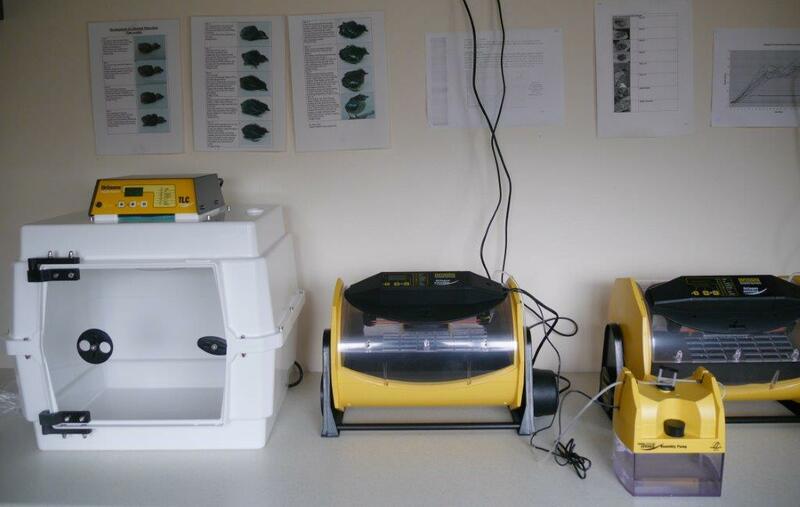 New incubation and breeding equipment arrived this month. 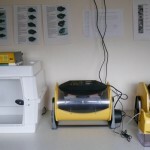 Staff are hoping to artificially incubate eggs and hand-rear chicks to be released alongside parent-reared chicks. Hand-reared individuals will respond well to the behavioural training required for the soft-release process. Parent-reared fledglings observing the hand-reared birds should pick up on the training quicker whilst at the same time share their natural life skills learned from their parents. One of Durrell’s education officers, Sarah Nugent, has kindly painted more dummy eggs. Keepers will use these if they need to rescue eggs but not the entire clutch. The real egg is swapped for a dummy egg, so that the female believes her clutch is unharmed and continues to incubate. Once the birds had settled into their new surroundings keepers added nesting material. Chough nests are built in three stages; foundations (twigs), structural support (heather thatch), and interior comforts (wool/horse hair). So far progress has been slow with the odd twig taken up to the nest, then removed when the female decides it is not to her liking. 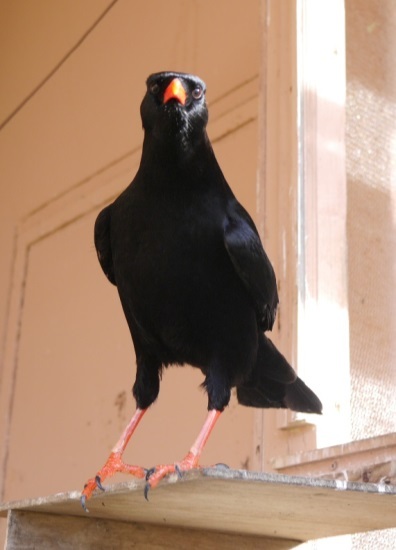 In the wild, choughs normally start nesting in March. The lack of commitment our captive birds are currently showing is not too concerning. 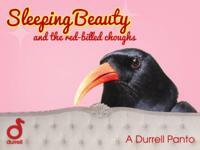 This year’s Durrell pantomime paid homage to Birds On The Edge featuring Sleeping Beauty and the red billed choughs. 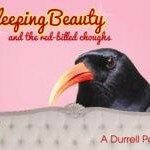 With a matinee and evening performance at the Jersey Arts Centre, crowds were entertained and educated about why Jersey has lost some of its most charismatic bird species, the need for grazing sheep, and why we all should boo loudly whenever we see an evil egg-snatcher lurking nearby. 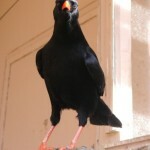 The choughs and Birds On The Edge also get a look-in at a very special art exhibition being held at the wildlife park. 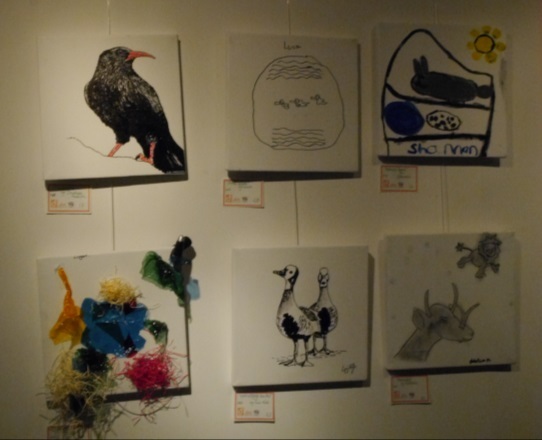 Lizi Hill, a Durrell Volunteer and art student, helped bring together Durrell, Brighter Futures, and Help a Jersey Child for a wildlife inspired charity art project. Thirty six families visited Durrell to spend time with the animals, learn about conservation, and get their creative juices flowing. Back in the studio children, parents, and staff set to work on their masterpieces using all sorts of medium from pencil sketches to textile collages. 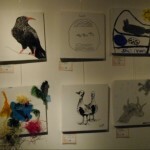 Art work is available for sale and can still be viewed in Durrell’s Princess Royal Pavilion. 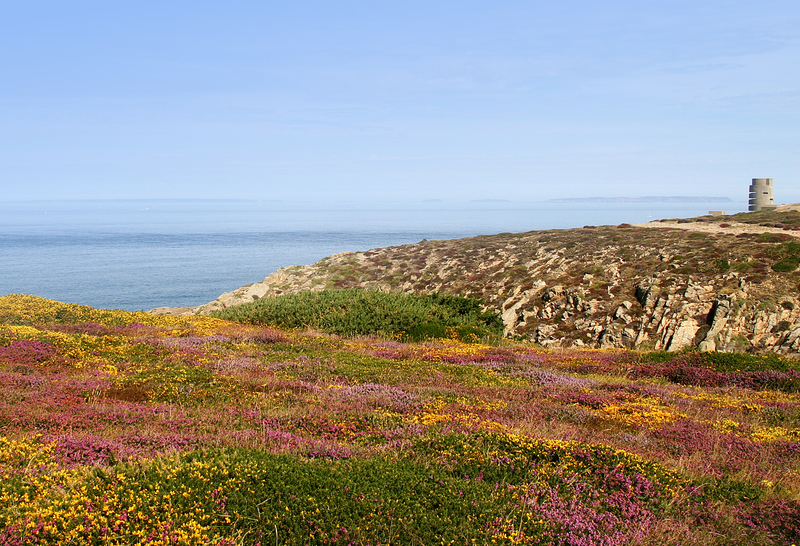 At the start of the month a short film was released about Birds On The Edge and the trial release of the choughs. This was filmed and produced by Annette Lowe who has kindly volunteered her time to the project over the past two years. With fifty hours of raw footage Annette had her work cut out trying to condense the story into just thirteen minutes. The film can be seen here as well as on Annette’s YouTube channel. Hopefully the public will gain a better understanding of what is involved in this sort of work and increase their support for the project.